Simply pop a flower or 2 on your creations, they can be stamped, handmade, store bought, whatever you like! This week we are showcasing Altenew Products this week. You don’t have to use them for the challenge but if you have them we would love to see them used. I went to town with this challenge. I made three cards. 1. Card Base is white cardstock. 2. On a card panel, I sponged Cracked Pistachio and Spun Sugar distress inks on the edges. 3. I used various Simon Says Stamp stencils to layer over the sponged edges and sponged Abandoned Coral and Peacock Feathers distress inks. This adds layer and interest on the background. 4. I stamped the images from Altenew’s Wild Hibiscus stamp set all around the panel. 5. 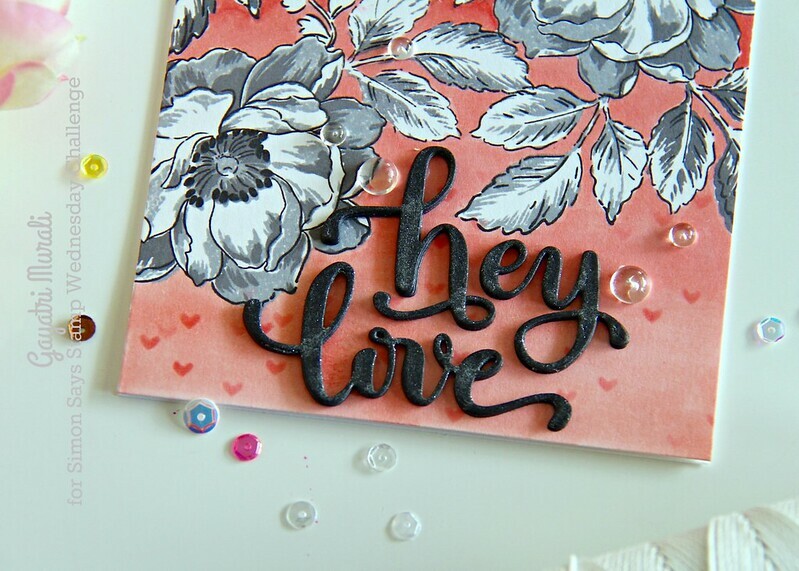 The sentiment Hey Love die from Simon Says Stamp Hey Love collection, die cut using black cardstock, stacked and glued and adhered on the centre of the panel. 6. 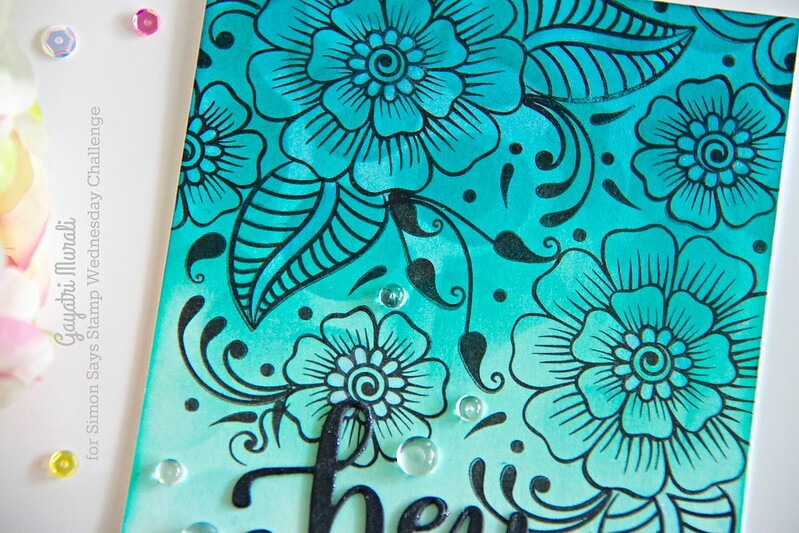 The completed panel is adhered to the cardfront and embellished with Clear Droplets from Pretty Pink Posh. 1. Card base is white card stock. 2. I trimmed a white card panel to the size of the card front. 3. 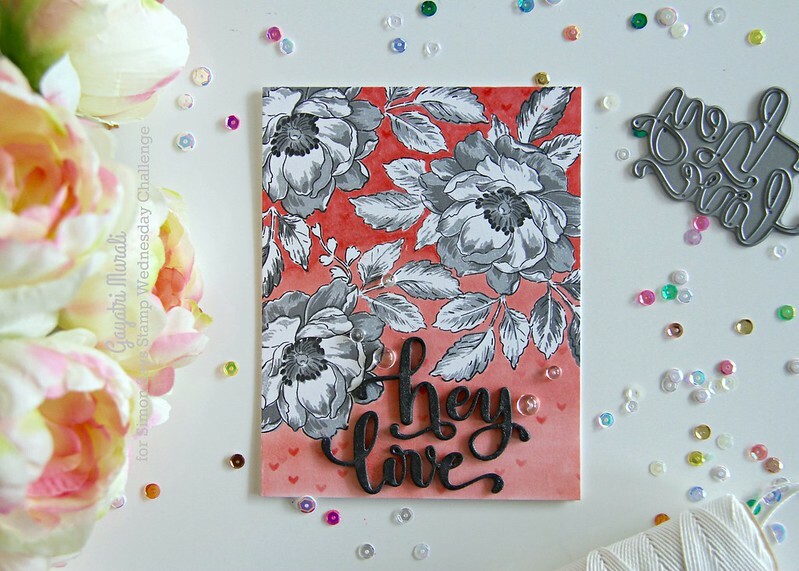 I stamped the floral images from Altenew Beautiful Day stamp set using shades of grey dye inks with black outline. 4. Then used copic markers R20, R21 and R22 to colour the background in ombre . 5. I used Simon Says Stamp Falling Heart Stencil over the panel and sponged Abandoned Coral distress inks to add layers. 6. 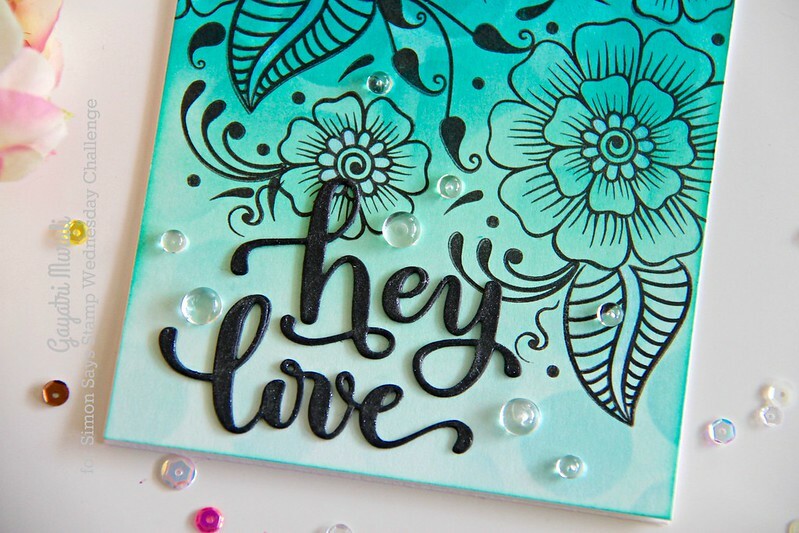 The sentiment Hey Love die from Simon Says Stamp Hey Love collection, die cut using black cardstock, stacked and glued and adhered on the centre of the panel. 7. 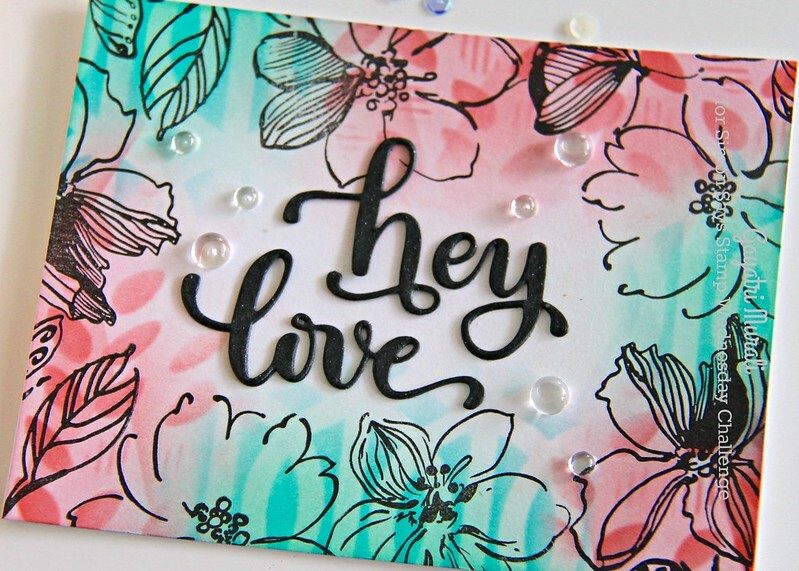 I adhered this panel to the card front, brushed Wink of Stella clear shimmer on the stacked sentiment and embellished with Clear Droplets from Pretty Pink Posh. After making the first two card, I now need a third card in the mint colour to make a set of three cards. 2. I trimmed a white panel to the size of the card front and sponged distress inks Cracked Pistachio, Peacock Feathers and Evergreen Bough. 3. I again using various Simon Says Stamp stencils on the panel and sponged distress inks Evergreen Bough and Peacock Feathers to add interest and layers to the background. 4. Then I stamped the images from Altenew’s Hennah Elements stamp set using black ink from top of the panel to about 3/4th of the panel to the bottom. 6. I adhered the completed panel on the card base, brushed Wink of Stella clear shimmed on some parts of the stamped elements and finally embellished with Clear Droplets from Pretty Pink Posh. Couple of closeups of the card. So now it’s YOUR turn to get out your floral supplies and join in! Brilliant job, you over-achiever! LOL. 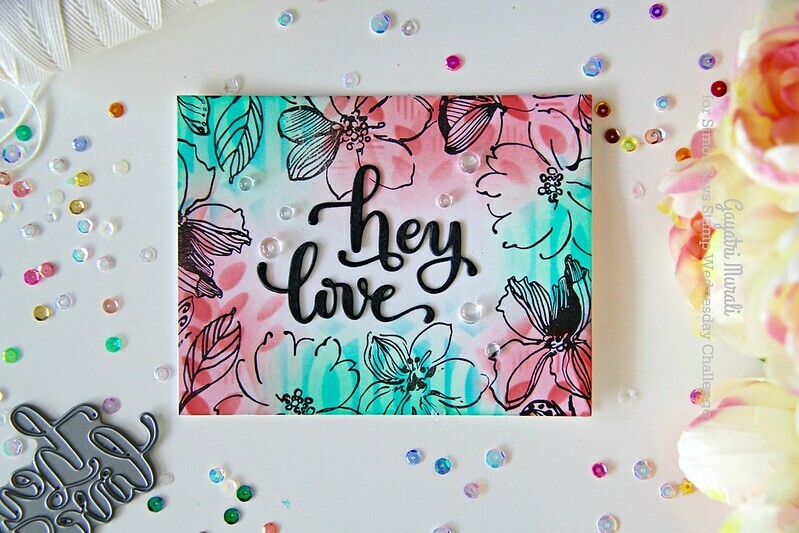 These are three gorgeous cards are well thought-out designs, Gayatri! I do love the first one the most since the color combo is simply divine! Oh my gosh! Gayatri, you are such an awesome artist!! All 3 cards are totally stunning it's hard to pick a favorite!! 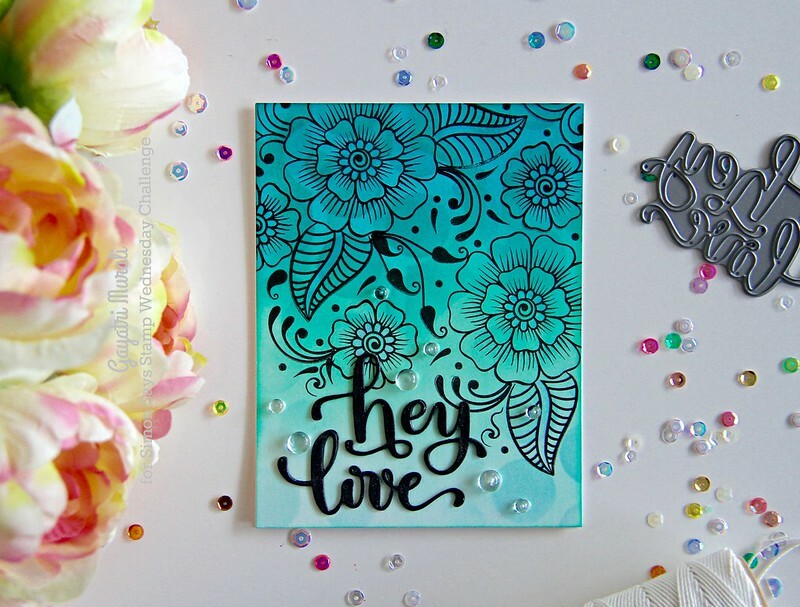 You've really shown the range of Altenew flower stamps, Gayatri! My fave is the 2nd one! So graphic! How original to add a soft background like that, really gives a subtle dimension to your cards which is so interesting! All three of them are gorgeous!